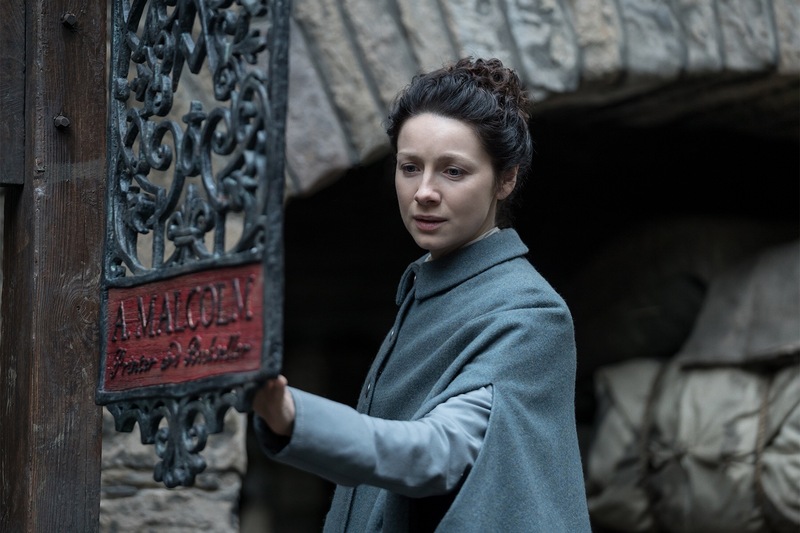 In last week’s recap of Episode 304, I mentioned that it was a very “Jamie heavy” episode and I guessed that episode 305 would be very “Claire heavy.” I was right of course but it wasn’t hard to be right because in the books we are kept in the dark as to the details of Jamie’s life from the time he left Helwater until Claire comes face to face with him in the Print Shop. Holy Potato chip I was definitely taken by surprise at the end of this episode. Way to go Toni Graphia! You know for book readers, we know everything, we know when something is missing or left out, down to the smallest detail – well I do at least (I have a slight obsession). Anyway, it is hard to surprise avid Outlander fans like myself but they managed to do that yet again! Episode 305 Freedom and Whisky starts with Claire and Joe doing an intensive surgery. 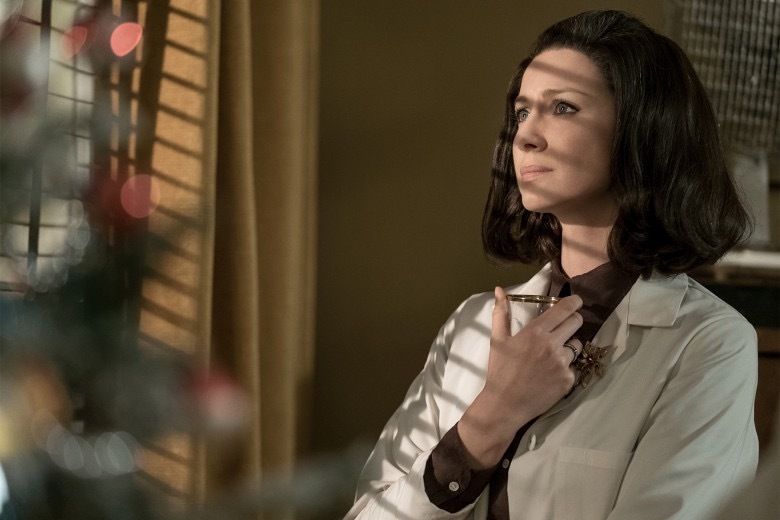 I am glad we got to actually see Claire in action as a surgeon before she heads back to the 18th century. 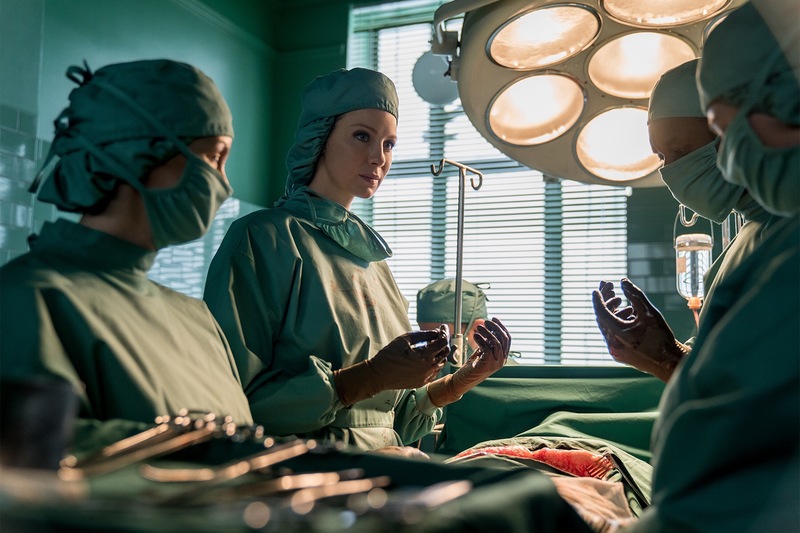 We establish that Claire is a very good surgeon with great instinct…we also learn what “packing” is…yuck. Claire makes a risky move during surgery but it pays off. JABS gives Claire the “I’ll be damned Lady Jane,” look and the surgery is concluded. (Read a Breath of Snow and Ashes). 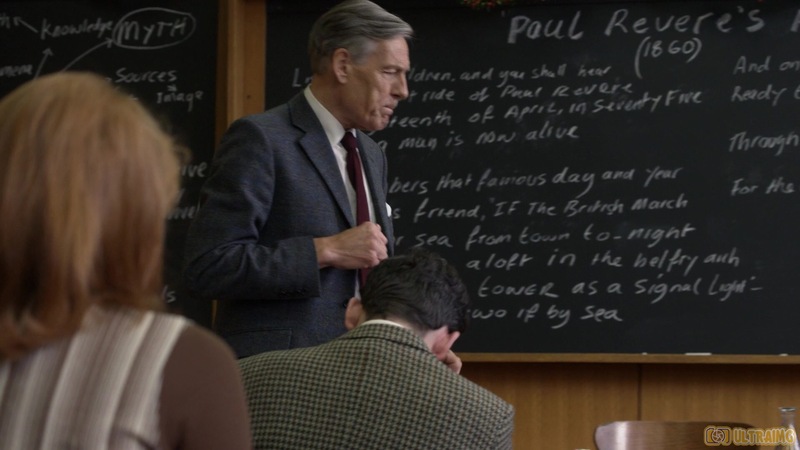 Anyway, the professor points out that Paul Revere lied. William Dawes and Samuel Prescott were also with Paul Revere that night. The Redcoats captured Revere in Lexington and Prescott completed the mission. This further confirms to Brianna that you can’t always accept the stories told to you as truth. Home girl is developing some trust issues. After class Brianna’s professor tells her she is failing. Brianna keeps a completely unreadable face during this conversation, a talent inherited from her father, the redheaded one that is. “You’ve got to turn this around Brianna, or your future here is in jeopardy,” he professor says. 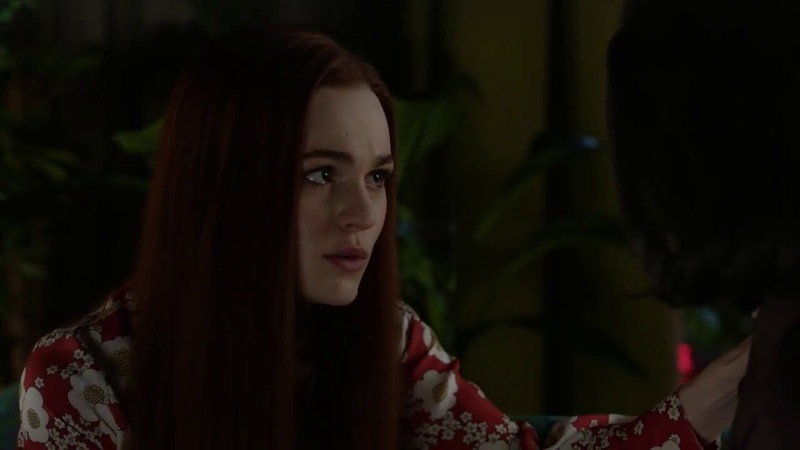 If he only knew…..
Brianna arrives home late that evening to a dark empty house, in the recent past it was likely that she didn’t often come home to an empty house because Frank would have been home. She touches her first Christmas ornament and you can see that she is feeling the emptiness of not having her father, Frank, there. This will be Brianna’s first Christmas without Frank. Brianna lovingly looks over some things on Frank’s desk, his pipe, some pictures…she really misses her daddy. And of course, the Frank theme music gently floats through the air and we are all sad. Frank was Brianna’s constant, he was her everyday, her champion and she misses him terribly. It is really beginning to hit her that the life she knew is gone. I think Brianna’s hurt is too great for her to really share it with anyone yet. Claire and Joe (or JABS as I fondly refer to him) are in their shared office after a long day of work. JABS pours a stiff drink (Whisky) for the both of them and then asks, “You ever gonna tell me what really happened over there?” You can tell that Claire would love to tell him every detail but unfortunately, she knows that talking about time travel makes her sound like a lunatic. So, she tells him as much as she can without sounding crazy. Claire tells Joe that she was hoping to reconnect with someone from her past but fate had other ideas and JABS says, “F**K fate.” You know it’s your BFF when they say what you really need to hear. Claire gets ready to heads home and Joe says, “TO be continued,” he’s not done with that conversation yet. A taxi pulls up and the giddy little ditty is playing “Show me a man that’s got a good woman.” Roger steps out of the taxi and is riddled in self-doubt to which he expresses to the less than amused taxi driver. Roger walks up the steps and hears the Randall women in the midst of a quarrel. A weaker man would have high tailed it out of there in a jiffy but not good ole Roge. He rings the doorbell twice. Brianna answers the door rather rudely, “WHAT,” she demands. She sees Roger and softens. Claire is surprised but happy to see Roger. Roger realizes he may have come at a bad time. Brianna has decided to withdraw from school and move out. Claire doesn’t think it is a good idea but Brianna has more on her plate than Claire is willing to admit. Brianna leaves but tells Roger they will hang out tomorrow. I’m glad she didn’t leaver the poor guy hanging. 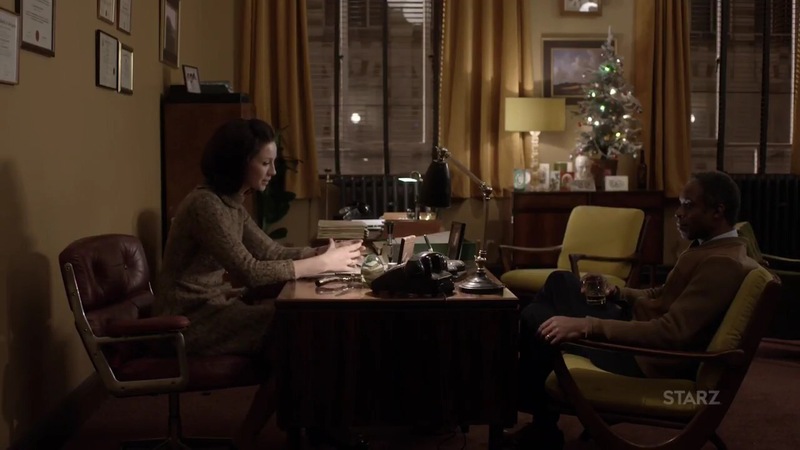 Over dinner, Roger and Claire discuss old Christmas traditions. The way Roger says “Mrs. Graham’s plum pudding,” is so adorable I may die. 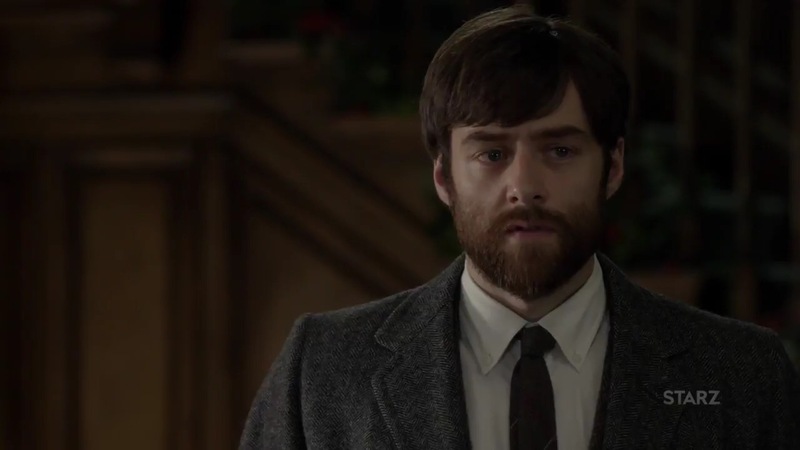 Richard Rankin is the perfect embodiment of Roger and I could just gobble him up like a tasty bowl of plum pudding. Roger says that one of the reasons he took this trip was to experience an American Christmas, Claire knows that there is a little more to it than that (everyone knows you have the hots for Brianna, Roge, ok?). “You seem to be a magnet for our family quarrels,” Claire says. To which Roger replies good-naturedly, “You were quarreling. I hadn’t noticed.” He’s just so perfect, gah! I love him. Claire is glad Roger is there, for Brianna’s sake, she knows Brianna need someone to talk to who really understands her. 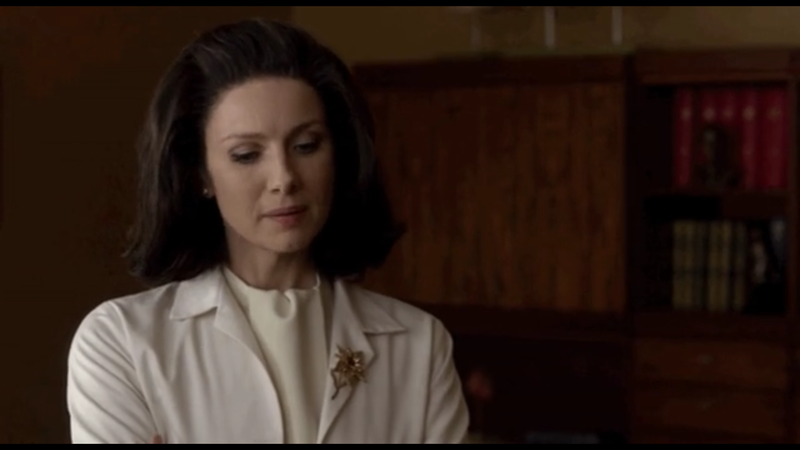 I have to say that I really love that Diana Gabaldon created the perfect counterpart for Brianna. Brianna is fiercely independent and certainly doesn’t need Roger and he knows it. Their story line is so beautiful because Roger continues to choose Brianna no matter what and in turn, Brianna becomes utterly devoted to him…but enough jumping ahead. 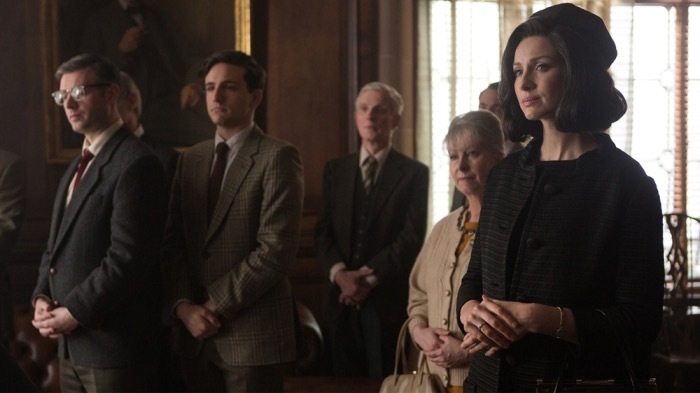 Roger pours Claire some whisky (because this episode is Freedom and Whisky is it not?) and he has some news. “I’m a historian, that’s what I do. I pursue,” Roger says, and don’t we know it! 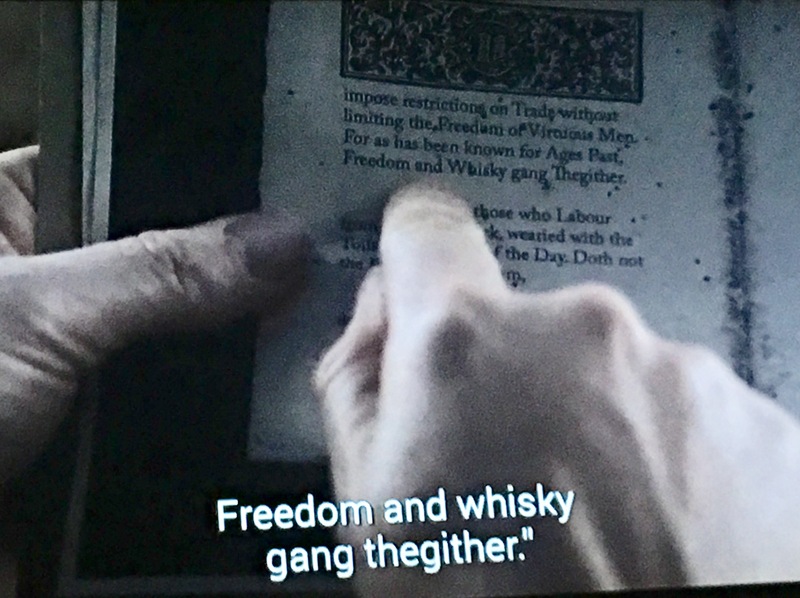 “I’m like a dog with a bone.” Roger found an article written in 1765 with a poem that Claire had quoted to Jamie when she was in the past, “Freedom and whisky gang thegither.” The article was printed by, Alexander Malcolm, which are coincidentally (or not) Jamie’s middle names. Roger tells Claire that only someone with knowledge of the future could have quoted lines of a poem that hadn’t been written yet. Claire is having A LOT of feelings about this news. Claire doesn’t want to get her hopes up. “This isn’t just hope, this is real, you can go to Jamie,” Roger tells her. 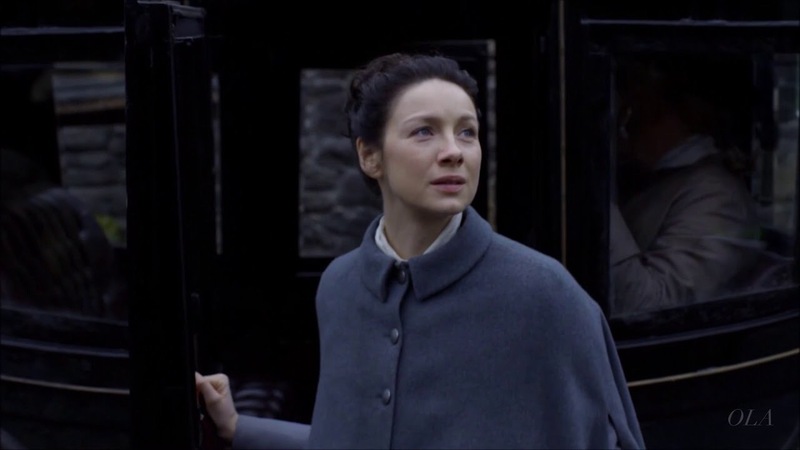 Claire doesn’t want Roger to tell Brianna, and he promises not to. Claire is back at the Hospital and JABS is looking over some bones that a Scientist friend sent over for him to find a cause of death. Claire picks up the skull and immediately says the bones belong to a murder victim. “Somebody tried to cut this lady’s head off with a dull bade,” Joe says. “Bones don’t lie,” Claire says. “They tell all,” Joe adds. Claire tells Joe that Jamie is Bree’s real father. He tells her that is she has a second chance at love she should take it. Claire is coming around to the idea. Brianna gets back to the apartment and Roger is watching a soap opera, they have a cute exchange and then Brianna apologizes about the day before. I love how Roger is so smitten by Brianna, just head over heels in love with her. Brianna is happy that Roger is there and invites him to join her at a ceremony honoring Frank at Harvard later. “I’d be honored,” Roger says. At Harvard Bree and Roger are walking under the Robinson Cloisters. Roger is fascinated with the history and Bree is fascinated by the architecture. Roger tries to tell Bree the importance of History and how it keeps the past real and helps you know yourself. Bree doubts the truth of history in general, “It changes depending on who’s telling it. History can’t be trusted,” Bree concludes. Later Bree asks who that blonde woman was. Claire tells Bree the truth that Frank was planning to marry Sandy. Brianna asks if Frank hated her because she looks like Jamie. 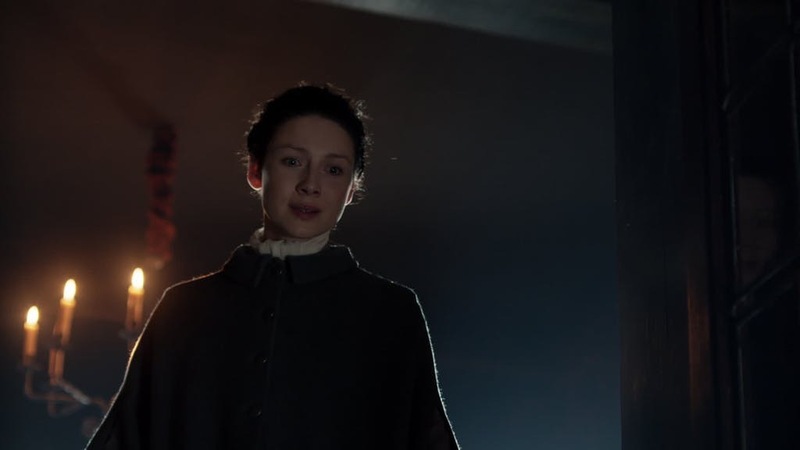 Brianna wants to know if Claire resents her because she had to leave Jamie. “I love you for you Brianna, not for the man that fathered you.” Claire shows Bree Roger’s findings and Bree encourages Claire to go to Jamie. Next, we see the hospital staff watching the Apollo 8 broadcast, “How do you take a trip like that, and come back to life as you know it?” Joe asks poignantly. The song of the druids floats through the air as Claire sips a glass of whisky. Claire and Bree are discussing the risks and hardships that come with the reality of Claire traveling back in time. “If I can turn out to be half the woman you are, I’ll be fine,” Claire says, “but I know you better that anyone.” “You know who doesn’t know me. Jamie,” Bree replies. Bree insists that Claire has to go, that Jamie gave Claire to her and now Bree has to give her back to him. 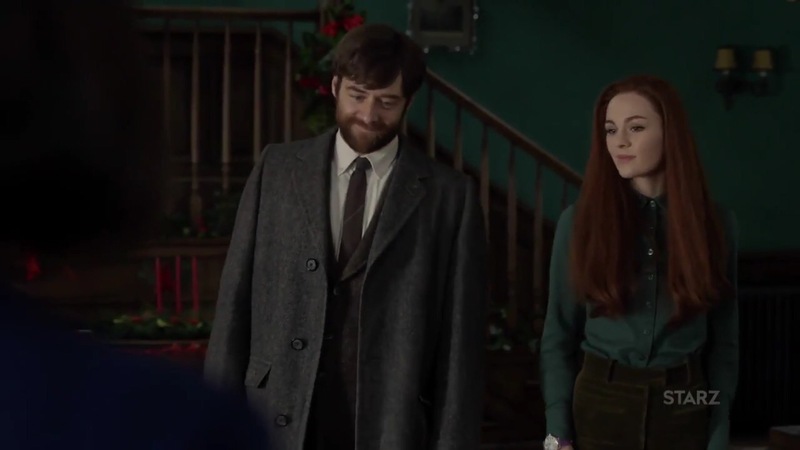 Back at the apartment, Claire is opening Christmas gifts from Roger and Bree. Now I commend the way this episode was orchestrated to make this all happen in one scene. Claire getting ready to leave for 1766 happens over a longer period of time and she is in Scotland with Roger and Bree over Halloween when she actually leaves. They don’t mention the timing of her departure or if the stones are “open” all the way during this time…perhaps we are to assume that the winter solstice is close enough to have sufficed for a safe journey through the stones. Roger and Bree give Claire, 18th century coins, that they found in an antique shop (in Boston – slightly farfetched but so is time travel so we’ll forgive them). A book about the history of Scotland and finally Bree gives Claire a topaz necklace (Bree’s birthstone). The gemstone helps a time traveler pass through the stones with a little more ease. Now to the last bit of business is what in the actual heck is Claire going to wear? This is seamlessly (yes I see the pun) brought about with the conundrum of where is Claire going to put all of this stuff when she goes through the stones. Roger half jokingly says she needs some sort of utility belt. The vintage batman theme song helped me get over all my feelings about the rearranging of the events from the book. No Jessica Gutenberg dress, no good omen of the policeman nearly bumping into Claire, and no Bree and Roger at the stones….and no stones for that matter. A huge chunk was cut out, but we know they are getting us to the good stuff the best way they can — and production can get tricky. 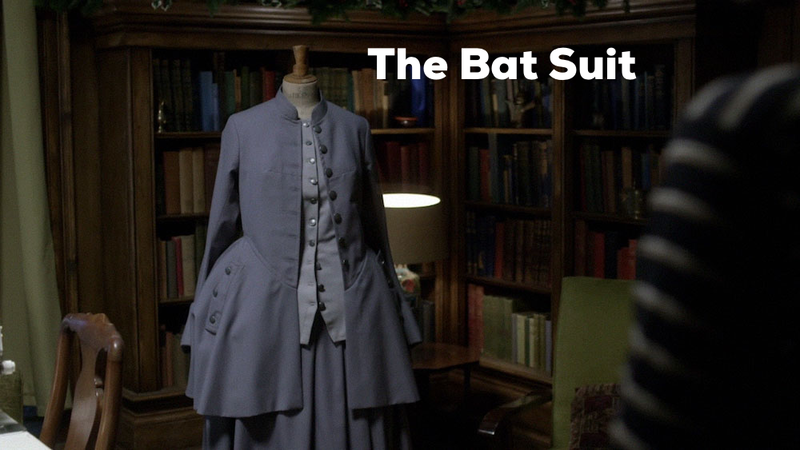 So here it is, the bat suit. Terry Dresbach is such a Goddess, she designs an 18th century get up that looks like it was made from raincoats that wasn’t actually made from raincoats. I mean, she just KILLS it week in and week out. Terry’s precision and level of expertise has pretty much ruined all other costume dramas for me, and I’m not complaining. However, I have recently noticed, that some costume dramas are really trying to step up their game in the costume department. Claire inspects her reflection in the mirror and sighs at her gray hair. 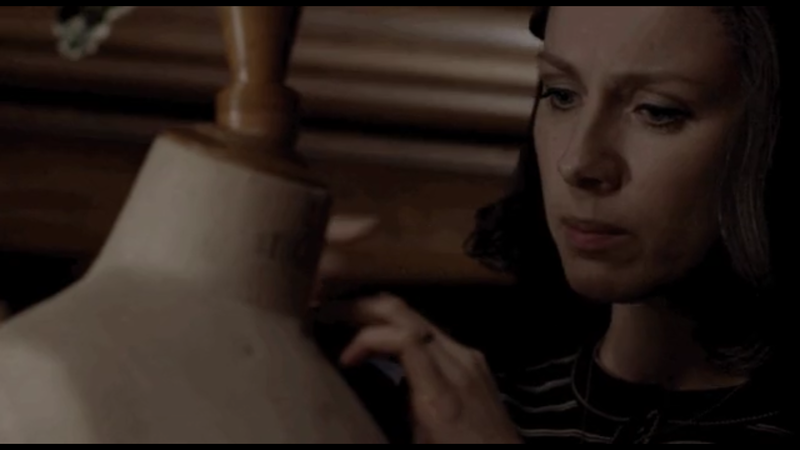 The next scene we see Claire putting the final things together in her suitcase. 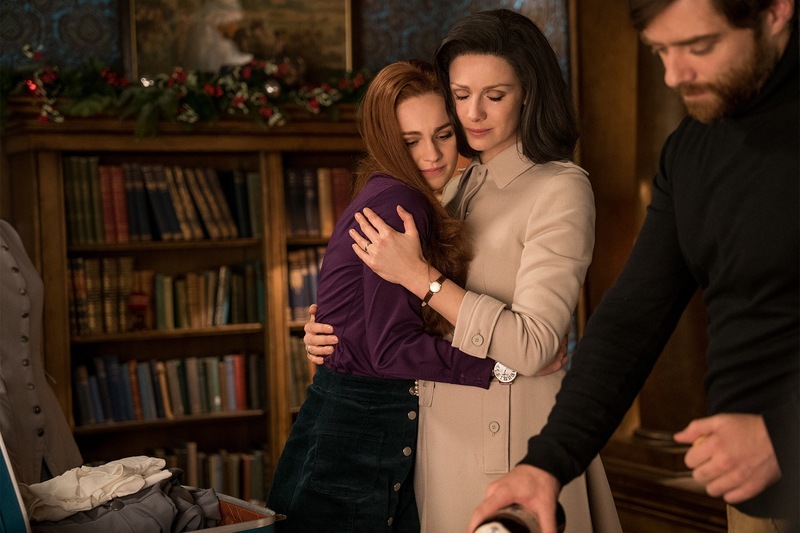 Bree and Claire share a final moment, Bree wants to be with Claire when she goes but Claire isn’t sure she can go through with it if Bree was there. 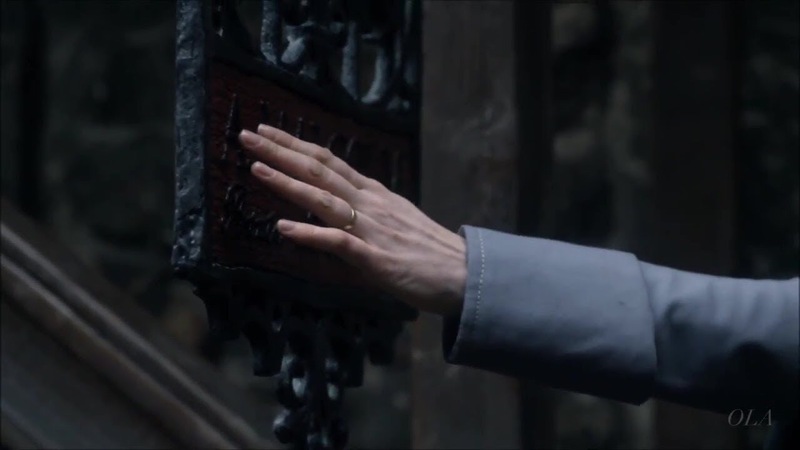 This moment is so lovely and bitter sweet, Claire gives the pearls Jamie gave to her to Bree. The Randal/Fraser women are teary eyed and Roger pours a “wee nip for the road.” They toast to Freedom and whisky one last time. 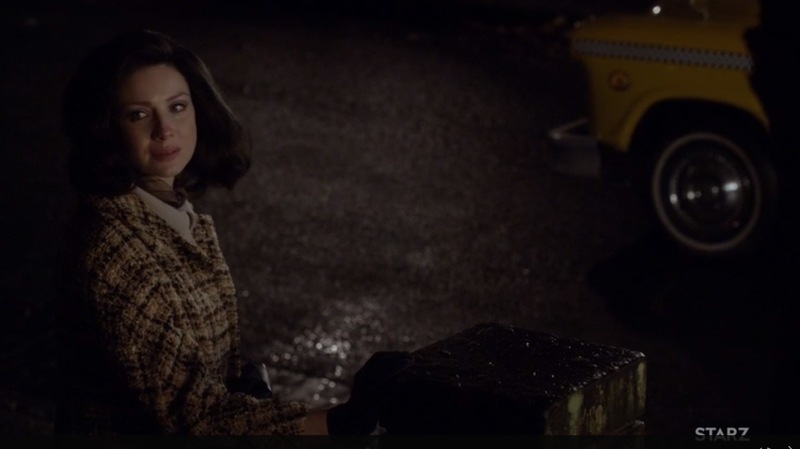 Claire steps outside, waves good-bye and steps into the waiting taxi. Bree throws herself into Roger’s arms. Bree goes to the kitchen puts on a Santa hat and brings out a tray of lobster rolls and Boston cream pie. Roger gives Bree the book, A Christmas Carol. Bree rewards Roger’s thoughtfulness with a kiss. They settle into the couch and Bree begins to read and Roger gets down on a lobster roll. You’ve really got to hand it to Roger because none of this would have been possible without him. “With only an echo of a thought left behind,” the voice over says and we see Claire step in a puddle and is suddenly in Edinburgh, 1766. I was honestly quite surprised that it happened so suddenly; I honestly didn’t think that she would get to Jamie until the next episode. But here we are at A. Malcolm Printer and Bookseller. The music swells and Claire nervously opens the shop door. The bell rings. “Is that you Geordie?” Our TV husband calls from within. Claire lays eyes on his back. “It isn’t Geordie. 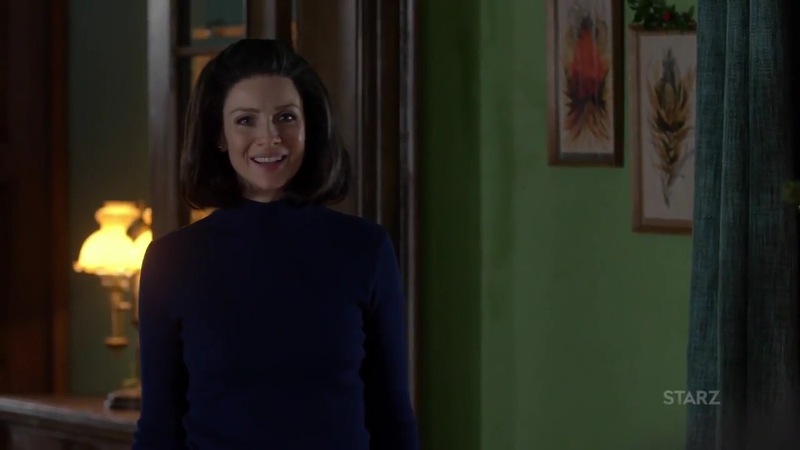 Its me, Claire,” she says and Claire really just looks so lovely here, there’s our girl, fully alive again. His face said everything, disbelief, realization, shock…and them boom. James Alexander Malcolm Mackenzie Fraser drops like the giant graceful hunk of a man he is. I love that the moment is so quickly interrupted and the last thing we see is Claire’s of sh** face. Episode 306 is going to be SO GOOD. I would say I can’t wait, but what choice do I have? Honestly, the anticipation and build up really does make it so much better. We get to enjoy a 74-minute extended episode on October 22nd. In an interview a few weeks back I believe it was Maril or Toni that said this episode is a love letter to the fans. I have a feeling that is will be a beautiful mirroring of the wedding episode. Ok I lied… I CANT WAIT!!!!! Watch the Episode 306 trailer here! Having read cliff notes ahead (whoops; couldn’t wait), I got the inkling we would possible see some Paul Revere mentions in future seasons. So it was a little fun to see Bri studying it in her class. The professor was in Gilmore Girls back in the 90s/00s, but he wasn’t creepy. My heart literally JUMPED and I think I gasped a little, too, when I heard his voice for the first time in the episode! haha, completely unconsciously so it was like hearing myself and I chuckled at my reaction. Such good storytellers they all are and terrific editing to build such an anticipation! I think that Hogmanay (New Year’s Eve) is also a time when it’s possible to travel through the stones. Since Christmas is right between winter solstice and Hogmanay, it sort of makes sense that they’d stay open in between: it’s only a period of about 10 days. Such a good point, love your insight Fran! The actor who played the creepy professor was in Downton Abbey — Lord Merton (if I recall the name right), Lady Violet’s friend who fell in love her Matthew Crawley’s mom (I forget her character’s name). Perhaps that’s why he looked familiar to you.